Camping Les Fonatine has it all. From stunning scenery, rushing water falls, towering mountains and whole host of family friendly activities on site, this luxury camping site at the base of the alps will not disappoint. Book now with LUX-camp and look forward to everything the Alps have to offer. Why Should I Plan My Camping Holiday at Camping Les Fontaines? 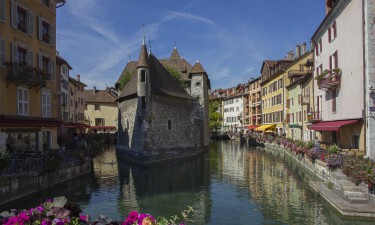 Camping Les Fontaine sits at one end of Lake Annency at the foot of the Alps. In the surrounding area you'll find breathtaking scenery including majestic mountain ranges, beautiful waterfalls and the Cascade de Seythenex cave system, all ready for you to explore. 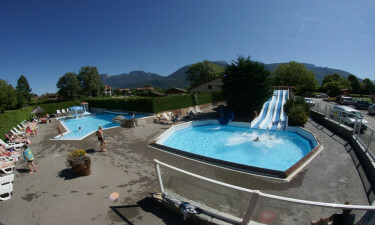 Camping Les Fonatine offers fun for kids of all ages and adults too. The fully loaded kids area will keep the little ones busy for hours and the swimming facilities have something for everyone. There's a paddling poor for the very smalls, an excellent pool for the adults to lounge in or take a few laps and even a five lane water slide for the young and the young at heart. Camping Les Fontaine offers some of the best luxury camping available with a range of fully fitted mobile homes to match your every need. You can book either a two and three bed mobile home at great nightly rates so you'll be well looked after if you're looking for the ultimate LUX-camp experience. Camping Les Fontaine offers excellent facilities for those looking for a bit of something special. Their on-site bar offers a full range of drinks and snacks and is open every night between mid-May and September. The on-site restaurant offers a diverse menu as well, and a beautiful patio for Al Fresco dining with great views of the surrounding scenery. The campsite itself sports a full stocked grocery store should you need to stock up on any essentials during your stay. Whether it's food or other camping must-haves, the local store has you covered. If you're looking for a more extensive retail therapy experience, then it's just a short drive down the road to the beautiful town of Doussard.